Ambarella A5s SoC with SmartAVC (Smart Advanced Video Coding), Ambarella's latest H.264 technology that targets low bit rates. SmartAVC provides excellent video quality at low bit rates to reduce storage costs and improve the streaming experience. 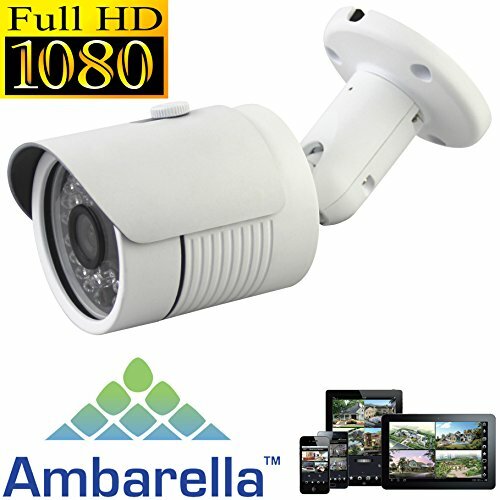 Professional Business Grade High Definition IP Bullet Network 1080p Security Camera **** Uses EXTERNAL PoE Splitter For PoE = Message Us Post Purchase For a FREE PoE SPLITTER TO USE WITH YOUR POE SWITCH!!! ONLY When Purchased From Seller 'Urban Security Group' = 3 Year Warranty + Lifetime AMERICAN Customer Support + 90 Day No-Questions-Asked Return Policy + Every Product Tested Prior Shipping ****** FOR A FREE EXTERNAL PoE SPLITTER TO USE WITH YOUR PoE SWITCH OR INJECTORS, MESSAGE US ('Urban Security Group') POST SALE!